Peak Energy: Is The World On A Path To Doom ? Is The World On A Path To Doom ? Editor and Publisher takes a look at the furore over the US Government's attempts to suppress warnings about global warming coming from NASA's James Hansen in a story called Is the World on a Path to Doom - With an Assist from the White House ?. While most Americans remain preoccupied with war, terrorism, high gas prices--or the coming Pitt-Jolie baby--an issue that may dwarf all of those concerns receives major attention on the front page of the Sunday editions of The New York Times and The Washington Post. One story raises a nightmare global warming scenario for the end of the world, at least as we know it, while the other suggests that the Bush administration doesn't want anyone to know about that. The scientist, James E. Hansen, longtime director of the agency's Goddard Institute for Space Studies, said in an interview that officials at NASA headquarters had ordered the public affairs staff to review his coming lectures, papers, postings on the Goddard Web site and requests for interviews from journalists. Mary L. Cleave, deputy associate administrator for NASA's Office of Earth Science, said the agency insists on monitoring interviews with scientists to ensure they are not misquoted. "People could see it as a constraint," Cleave said. "As a manager, I might see it as protection." The Independent has an article on the possible decimation of plankton by global warming (via MonkeyGrinder, who is displaying an unhealthy interest in Vogon poetry). The microscopic plants that underpin all life in the oceans are likely to be destroyed by global warming, a study has found. Any plankton haul near the surface of the sea brings in a huge variety of life forms. Plants animals larvae adults vertebrates invertebrates carnivores and herbivores are all represented in the plankton community. Scientists have discovered a way that the vital plankton of the oceans can be starved of nutrients as a result of the seas getting warmer. They believe the findings have catastrophic implications for the entire marine habitat, which ultimately relies on plankton at the base of the food chain. The study is also potentially devastating because it has thrown up a new "positive feedback" mechanism that could result in more carbon dioxide ending up in the atmosphere to cause a runaway greenhouse effect. Scientists led by Jef Huisman of the University of Amsterdam have calculated that global warming, which is causing the temperature of the sea surface to rise, will also interfere with the vital upward movement of nutrients from the deep sea. The BBC has an article on a "Stark warning over climate change" issued by the UK government. Rising concentrations of greenhouse gases may have more serious impacts than previously believed, a major scientific report has said. The report, published by the UK government, says there is only a small chance of greenhouse gas emissions being kept below "dangerous" levels. It fears the Greenland ice sheet is likely to melt, leading sea levels to rise by 7m (23ft) over 1,000 years. The poorest countries will be most vulnerable to these effects, it adds. The report asked scientists to calculate which greenhouse gas concentrations in the atmosphere would be enough to cause these "dangerous" temperature increases. Currently, the atmosphere contains about 380 parts per million (ppm) of carbon dioxide, the principal greenhouse gas, compared to levels before the industrial revolution of about 275ppm. To have a good chance of achieving the EU's two-degree target, levels should be stabilised at 450ppm or below, the report concludes. But, speaking on Today, the UK government's chief scientific adviser, Sir David King, said that was unlikely to happen. "We're going to be at 400 ppm in 10 years' time, I predict that without any delight in saying it," he said. "But no country is going to turn off a power station which is providing much-desired energy for its population to tackle this problem - we have to accept that. 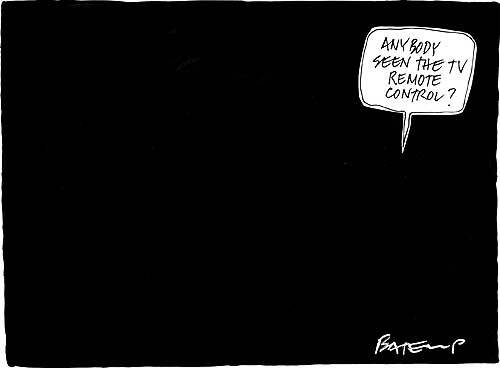 Gary Sauer Thompson has some comments on the recent blackouts in South Australia. The extreme heat conditions are due to return in a few days. So we can expect more power blackouts or rationing. And more promises tto fix things that will not be kept. And we wil have ever more reliance on electricity generated from those coal-fired powerplants in the eastern states that produce the greenhouse emissions.That's the national grid for you. It is unlikely that the national grid lacks sufficient capacity at this point to handle spikes in demand (though if there is a plant failure for whatever reason prices do go through the roof) and if a shortfall of supply does occur the standard procedure is to turn off some major consumers (aluminium smelters in particular). However user demand grows ever higher (thanks to poor new house design, increasing summer temperatures and ubiquitous air-conditioning - not to mention the ever increasing proliferation of computers and other household gadgets) so there is a fairly continuous stream of announcements of new additions to the grid - in SA AGL has just announced they will be building the nation's largest wind farm, while in NSW they recently announced a new gas fired peaking plant (using coal seam methane if my memory serves me correctly), while Delta has announced they will be increasing the capacity of some of their (coal fired) plants as well. The Australian Gas Light Company (AGL) today announced it is to spend $236 million to construct Australia’s largest wind farm at Hallett, 220 kilometres north of Adelaide in South Australia. Construction of the wind farm, which will result in 45 wind turbines on a 14-kilometre area over the Brown Hill ridge near Hallett, is scheduled to commence in September 2006 with initial commissioning expected in December 2007. The company is expecting the project to create around 150 jobs during the construction phase, while the 95 megawatt (MW) facility will be integrated with AGL’s existing 180 MW gas-fired peaking power plant at Hallett. AGL Managing Director Greg noted that the new wind farm would help the group meet its commitment to increase the amount of electricity generated from renewable sources and also contribute to AGL’s obligations under the Federal Government’s Mandatory Renewable Energy Target scheme ("MRET") by supplying around 24% of AGL’s future Renewable Energy Certificate ("REC") requirements. “Hallett is an ideal location for a wind farm as it offers a number of competitive advantages including one of the largest wind resources on mainland Australia, access to existing infrastructure and close proximity to the high voltage electricity transmission system,” said Mr Martin. “The strategic location at Hallett will also enable the development of an integrated gas-fired power plant and wind farm facility to ensure continuous operation during periods of high electricity demand,” Mr Martin added. Currently, Australia’s largest wind farm is the 91 MW facility at Wattle Point in South Australia, which AGL also owns following its acquisition of Southern Hydro in October 2005. The Herald has an article on mining and energy giants BHP and RIO, which mentions BHP's hurricane induced production problems. While the author seems to think oil exposure isn't a big positive for BHP, personally I suspect BHP's oil, gas and uranium assets will make it more successful than RIO in a post peak world (which would likely consume much less iron ore and aluminium) - especially if there is a bust in China, which seems to be a reasonable possibility in the medium term. In the middle of 2003 China was booming but the markets hadn't woken up to it. I was in Hong Kong, chatting with Morgan Stanley's China economist, Andy Xie, and I asked him what Australian investors needed to do to get on board. "Buy big resources companies with China contracts, put them in your bottom drawer, and don't take them out for 20 years. When you finally do, you will be a wealthy man," Xie replied. It was good advice. BHP shares were available for less than $9 a share when Xie and I spoke, and Rio Tinto shares were a shade over $29 each. On Friday, news that China's economy grew by 9.9 per cent in 2005 propelled them to new peaks that few imagined then. BHP jumped 97c to $26.05 and traded as high as $26.35, and Rio shot up by $2.14 to $76.10, after trading as high as $76.25. Since mid 2003, BHP shares are up 204 per cent and Rio shares are up 160 per cent - but it is Rio that is outperforming now. The two shares marched up in step in the first eight months of 2005 but since then BHP shares have risen by 25 per cent and Rio by more than 46 per cent. If Australia has a genuine corporate icon, Melbourne-based BHP Billiton is it, but powerhouse commodity prices and powerhouse profits are masking the fact that, compared with Rio, it is a more complicated investment proposition in 2006. BHP is not a pure miner, for one thing. It is also a substantial oil and gas producer, and it is worth noting that Rio's shares began to outperform just after the oil price peaked above $US70 a barrel at the end of August last year, when Hurricane Katrina belted the Gulf of Mexico. The oil price is rebounding now on fears that Iran's nuclear ambitions will see its share of OPEC production withdrawn or withheld from the global supply chain, but it isn't back to last year's Katrina highs yet. Katrina and other Gulf of Mexico hurricanes also affected BHP's own oil production directly. The group is developing significant acreage in the gulf and said in October that it was scaling back its oil and gas production forecast for 2006 by as much as 8 per cent to take the effect of the hurricanes into account. In its quarterly production report last week it added that hurricane activity had created equipment shortages that were pressuring its development timeline. Now I wouldn't want to suggest that having an oil business is an outright negative for BHP Billiton. Oil has been a fantastically profitable business for the group in recent years and as the oil price rises again on the Iran concerns, continues to be. But BHP's experience in the Gulf of Mexico last year and the highly politicised gyrations in the oil price are something some investors may be considering. Rio, on the other hand, has no oil. And it has more exposure to one of the commodities most affected by China's boom: iron ore. Rio produces more iron ore - almost 30 million tonnes in the December quarter compared with almost 23 million tonnes by BHP Billiton - and its iron ore business accounts for 38 per cent of the total group on a net present value basis. On the same basis, iron ore accounts for about 17 per cent of BHP's total enterprise. Technology Review has an article on US energy policy, with some experts saying too much funding is going into hydrogen at the expense of near-term technologies (leaving aside all the other glaring problems with that particular set of policies). High oil prices and the dangers of global warming have some experts hoping that President Bush's State of the Union address tonight will redirect energy research priorities. The president, they say, needs to start funding a wider range of promising technologies, including ones that could have a near-term impact on both fuel costs and emissions. "There clearly are serious issues about the balance of the [research] portfolio," says Ernest Moniz, former undersecretary at the Department of Energy and now professor of physics at MIT, where he co-chairs the Energy Research Council, set up to spearhead energy research. Moniz says there "is a huge amount" of money going into research on new technologies, especially for transportation, that use hydrogen for fuel. Yet such hydrogen technology "is a very long way into the future, if ever, whereas lots of other kinds of work that could have very profound impacts in the shorter term are not being funded." In his 2003 State of the Union address, President Bush proposed $1.2 billion for hydrogen research. According to Moniz, shorter-term technologies that deserve more funding include advanced internal combustion engines and new techniques for burning fossil fuels more cleanly in power plants. Advanced engines could improve fuel efficiency by 15-20%, he says, significantly easing the demand for oil, while simultaneously decreasing emissions. One promising candidate is homogeneous charge compression ignition, known as HCCI, a technology that uses sophisticated controls to combine the best elements of diesel and gasoline engines. Since the advanced controls make the engines tunable for running on different fuels, they could further decrease dependence on oil by burning ethanol, biodiesel, or even hydrogen. In sme oil related news, the Observer has a report on the Nigeria situation called "Oil delta burns with hate". Fears are growing from investors, oil workers and agencies working in the Niger delta that the escalating violence may force the four major oil companies - Royal Dutch Shell, Chevron, Exxon and ENI - to close onshore operations. Shell relies on Nigeria for 11 per cent of its global output. But it has suffered four attacks in recent weeks and had to cut production in the delta by 10 per cent. Now some Shell insiders are privately questioning how secure its operations are and to what extent it can rely on production there. Shutdowns would not only hurt the revenues of oil majors but also threaten a surge in oil prices. The Niger delta is already classified by international agencies as a danger zone on a par with Chechnya and Colombia. The number of guns in circulation has increased dramatically since 2003, the year the last presidential elections were held. Those elections were widely condemned as being rigged, with armed gangs seizing ballot boxes and intimidating voters. Criminal gangs with international connections make billions of pounds by 'bunkering' - illegally siphoning off - a tenth of all Nigerian oil. Some say the oil firms must know oil bunkering happens but tolerate it so operations can continue. Bunkering gangs then launder their cash abroad and buy machine guns to bolster their criminal empires. Then there has been the recent rise of the Movement for the Emancipation of the Niger Delta (Mend). The organisation claims responsibility for the kidnapping of Shell workers and is demanding $1.5bn compensation from the firm for the pollution it says Shell has caused. Some suggest that the wave of violence will see oil majors sell out to Chinese firms desperate to secure oil supplies, who will come into the country with a clean slate. Two weeks ago, Cnooc, the state-owned Chinese energy company, said it would pay nearly $2.3bn to acquire a large stake in a Nigerian oil and gas field, one of the biggest overseas acquisitions by a Chinese company. Others say that the Nigerian government has plans to take control of the oil industry in a tactic similar to that used by Russia's President Putin. One thing is clear, though: the oil supply from Nigeria is now far from secure - and it could not have come at a worse time for the global economy. And to close, one from last week - Past Peak takes a look at Jerome a Paris' post on the world's 4 major oilfields being in decline (though I'm a bit dubious that anyone has proved that Ghawar is in decline with any degree of certainty). So we stopped finding super-giant fields long ago. What about the super-giants currently in production? The Cantarell oil field, in the shallow waters of Campeche Bay, is regarded by Mexicans as their crown jewel. It is the second largest oil field in the world by production, behind Saudi Arabia's mammoth Ghawar oil field, pumping 2.2m barrels a day, the same amount as all the Kuwaiti fields together. Kuwait — Kuwait's Burgan, one of the five largest oilfields in the world and until recently the world's number two in production, is in decline as well. See this post from a couple of months ago. No super giant fields have been found in the past 25 years, and all the rock structures on the planet where such fields could be found are known. We will not find more oil. We will squeeze more out of the existing fields, thus generating new "reserves" (in their economic definition), but we are already running out of the cheap and easy to produce stuff. Peak oil is very real.